This last November I returned from an eight month backpacking trip in Central America and Mexico to the need for a good bike to do the Pacific Coast ride from San Diego to Vancouver, Canada. I had done this trip before on a Honda VTX1300, and absolutely loved the experience. This time I was to make the journey with an English girl I had met while traveling. She had never ridden on a bike, so I wanted something with a bit more wind to it than a V-Twin (don't ask about the logic). I also wanted something that retained the cruiser style for comfort, and was inexpensive to boot. Yes, you could say I had both a specific and demanding taste for this bike. 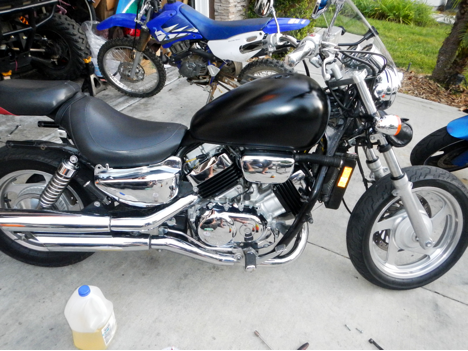 My VF750c partially dismantled while receiving a rattle can satin black paint job. When I began scouring the Craigslist pages there was one particularly obnoxious listing that stuck out to me. Usually when an ad states both "Fast" and "Loud" in the title I get immediately turned off (and don't get me wrong this time was no different), but I'm pretty meticulous when searching for bikes so in spite of the awful sales pitch I opened it up to find a very subjective description for a 1995 Honda Magna VF750. These bikes very commonly hover in the price range I find myself searching within, but I had always before found myself wandering off to different genres (dual sports, sport bikes). It wasn't until this iteration that I really decided this was the bike for me and not just the price for me. A 750 cc V4 powered cruiser, 4 carbs and 4 independent exhausts, inexpensive, reviews are all good, reliability excellent, transmissions are beasts known for longevity. In no time I was convinced I needed this bike. Within a couple days it was in my driveway, and as I expected the bike was everything I wanted it to be. It was quick for a cruiser, on par with the YZF600R I sold to my brother. It ran reliably well, and parts were readily available for it. Redline is 10,000 RPM which for a cruiser is generally unheard of (if there's even a tach on the thing to measure it). But with all my favorite parts of the bike came my confusion. Why were these not more popular? Is it really such a niche desire to have a fast cruiser? As is customary when I purchase a bike I sought out the most relevant online forum for it. I came to www.v4musclebike.com. The first thing I noticed when finding this site is that at one time Suzuki, Yamaha and Honda all had their V4 flagship (alongside I4 concepts within the same makes plus Kawasaki). Despite an incredibly loyal ownership base however, they were one by one picked from production over the years, until the present finds only the Yamaha VMax has survived the ages. When a bike offers a comfortable seating position for longer rides, a perky and responsive engine, decent fuel economy and excellent reliability (no replacing 2nd gear after 35,000 miles), where are people getting put off? It makes me wonder if there is a categorically different rider, one who enjoys speed and therefore the feel of a sport bike, and one who enjoys cruising and therefore the feel of a thumper or V-Twin. Or do the masses just not like interbreeding? I'd like to hear from readers on this one – current owners, past owners and non-owners alike. What are your feelings toward this genre? Regardless of public opinion, I'm all about this bike.